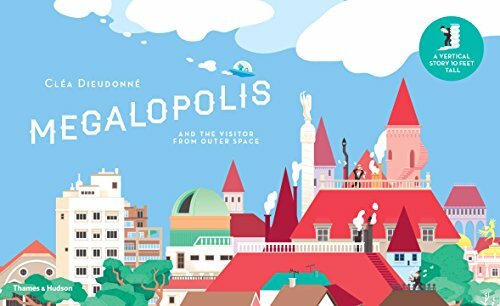 Megalopolis and the Visitor from Outer Space by Clea Dieudonne, may be one of the most unique picture books out there for children ages four to eight—not necessarily because of its story line, but because of its distinctive fold-out design. Thirteen-by-nine inches in dimension, this panoramic adventure is about a “magnificent city that people come from far and wide to see.” The book opens on the day that a curious visitor from outer space arrives to see what all the hoopla is about. After he lands his spaceship on a rooftop and meets the mayor of the city, the townspeople throw a welcome party, give him a parade, and even set off fireworks to show him how happy they are that he has come. Then follows a series of chaotic but sweet adventures, including a game of hide-and-seek, a visit to the zoo, a great time at the opera, and a chance meeting with a mermaid—all revealed one unfolded page at a time. If the reader likes to count, he or she just may find 514 townspeople, 5 policemen, 8 ghosts, 12 thieves, 3 giraffes, 20 birds and 33 fish—all, up, down, around, on top of, inside of, underneath or gazing through 118 buildings, 10 factories, 118 buildings, 8 bicycles, 51 cars, and a host of lovely flowers. This is a unique and exciting book that grows to gigantic proportions right before the reader’s very eyes; however, one consequence of a book with thirty-eight pages that unfold rather than turn is that readers may have quite a time figuring out how to manage the book in order to get to the end of the story. The pages unfold to ten feet long, which means that readers may need to place the book on something longer than the typical desk or table in order to enjoy it. On the other hand, Ms. Dieudonne’s bigger-than-life illustrations make managing the book worth it in the end. This book should be a great way for teachers, librarians or parents to inspire discussions about large cities versus small cities, citizenship, legends (i.e., mermaids), and the possibility of visitors from outer space.